Halley base was established in 1956 as part of the UK's contribution to the International Geophysical Year. Scientific research has continued uninterrupted ever since. From 1962 this has been run by the British Antarctic Survey. Measurements are taken of the ice of Antarctica beneath, of the air in the troposphere above, of the ozone in the stratosphere above that, and of the plasma in the geospace beyond them all. 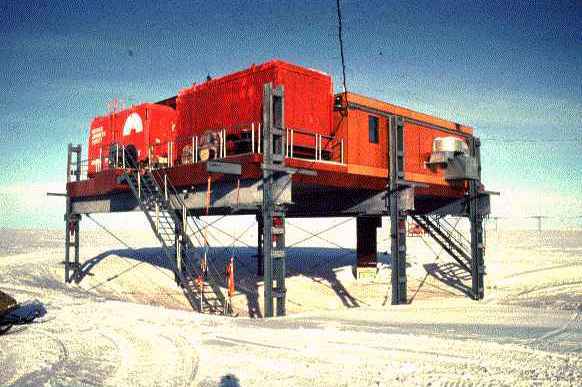 Most buildings at Halley stand on stilts to prevent them being buried by drifting snow and eventually crushed. This picture shows the Space Sciences building from which optical and radio experiments are run to remotely sense geospace.